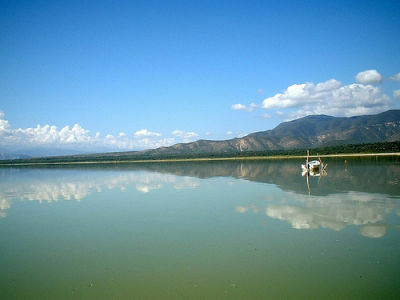 This 13 mile long lake(approximately 300 km²) is in an out of the way area in the southwest,western part of the Hoya de Enriquillo, very near to the Haitian border. It is the lowest point in the entire Antillies, 114 feet below sea level . Lake Enriquillo is 3 times saltier than the ocean. It is a great spot to see crocodile (Caimans), flamingo, and iguanas. The Isla Cabritos National Park is in Lago Enriquillo . This island has a very unique habitat. The original vegetation that once grew on this small island was lost to the goats and cattle that once grazed there and also due to the collection of timber. The new vegetation includes 106 species of plants, and 10 types of cactus. The area also boasts a large crocodile-caiman population. An endemic species of iguana along with other species of reptile populate the island. There are 62 different species of birds that have also been identified: five aquatic, 16 shore, and 41 land birds. 45 of these species are native to the island. Some of the birds included are the manuelito, the great hummingbird, the querebebé (which is best heard at sun down), and the cu-cú ( which sings at dawn and dusk, and nests in an excavated hole in the desert.